Is there a kosher meal plan on campus or is there only kosher food (prepackaged, frozen items) ? Is lunch and dinner offered everyday on campus? Are there meals on Shabbat and chagim, including Pesach? What organization (Va’ad) provides the hechsher to the kosher food? What are their standards? For example, is there a mashgiach tamidi (full time dedicated supervision)? Are a full range of menu options available (vegetarian, allergies, gluten free)? Which meals are meat and/or dairy? Are kosher meals fast-food only, or are healthy options available? Is the kosher meal plan part of the university meal plan or is it purchased through Hillel or Chabad? Is one required to be on a university meal-plan as a first year student, and how does this impact one’s flexibility with regard to obtaining kosher food? 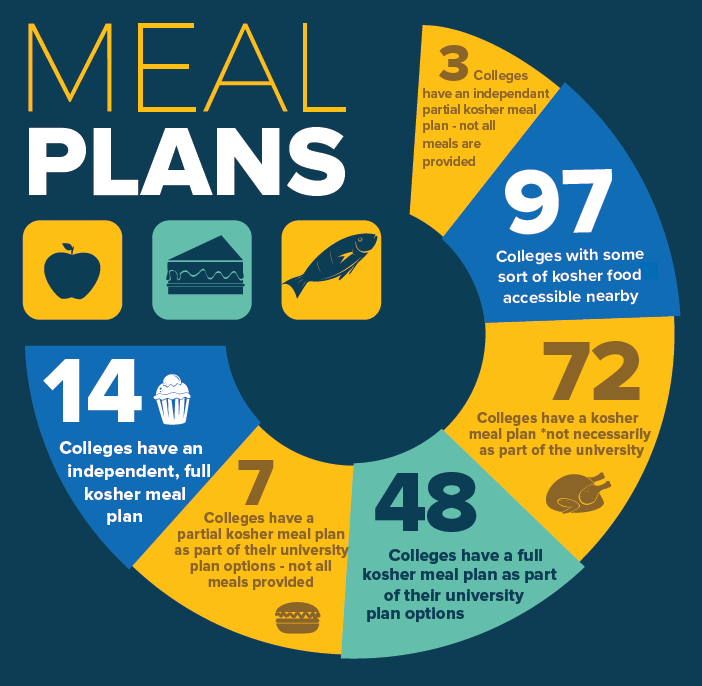 Do students typically participate in the kosher meal plan as upperclassmen? Do they have the option of maintaining their own kosher kitchens in their residence halls or off-campus housing? Are students able to sit in the cafeteria with friends not eating kosher food? Where is the kosher food on campus located? Is it in a central location? Are there “to go” options that can be pre-ordered and picked up or delivered for meals instead of eating in the cafeteria? If you don’t finish all of the money on your meal plan, what happens with the extra balance? Is kosher food available locally, off-campus, in supermarkets or restaurants? For more information about kosher food on campus check out the Jewish Resource Map created by Rabbi Hart Levine, Founder of the Heart to Heart Project. What can kosher-keeping students expect at universities around the country? The answer, of course, depends on the school. At Brandeis University in Waltham Mass, and Johns Hopkins University (JHU) in Baltimore, kosher students can enjoy a freshly made hot meal while breaking bread (on different plates and trays, of course) alongside their non-kosher-keeping classmates. Kosher students at Brandeis and JHU, among other schools, are able to partake in their kosher-certified, freshly made meals alongside their peers as part of their general meal plan. Students at JHU can order from a wide variety of options at Taam Tov, certified by the Orthodox Union (OU) inside the Fresh Food Café. While only 11 of the 14 weekly meals offered in the café are available kosher, the JHU Hillel provides the rest, which take place on Shabbat. At Sherman Dining Hall, an all-you-can-eat cafeteria on the Brandeis campus, a kosher meal plan is the same price as the standard meal plan. Kosher students are given a special ID card in order to eat from the kosher side of the dining hall. Brandeis Hillel explains how this is possible: “Meat and dairy products are prepared in separate, dedicated kitchens, utilizing two completely separate sets of utensils, dishes, stoves, dishwashers, and all other cookware,” says the organization’s website. “The kosher side of Sherman has rules to make sure that all the food is kept kosher; however, students sit wherever they wish in the cafeteria. Students use trays, and whenever they eat from the kosher side they make sure that everything stays on it. On Shabbat, trays are not available, and all of the plateware and silverware are disposable.” Former OU-JLIC Torah Educator on campus, Ariel Pardo, was amazed at the options, saying they were “incredible and delicious, not just edible.” In addition to the integrated cafeteria at Sherman, Pardo said there are two other options on campus: a kosher deli called Louis’s and a Dunkin’ Donuts, which, while not kosher, has select labeled baked goods and drinks available for observant Jews. 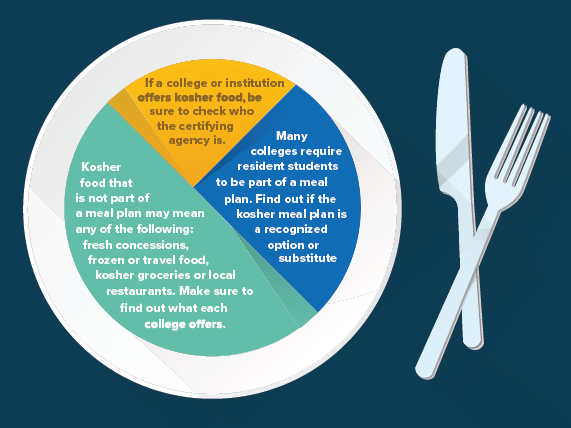 Another option for kosher-observant college students affords them the ability, with their regularly priced university meal plan, to eat at a full-service university-operated kosher cafeteria. Several schools, including Cornell University in Ithaca, NY, Princeton University, University of Pennsylvania, and New York University have this option. Princeton is certified by the OU, Cornell is under the Star-K’s supervision, and UPenn is certified by the Va’ad of Philadelphia. NYU’s kosher cafeteria, located in Weinstein Hall, offers both meat and dairy options, alternating daily. (Tuesdays and Thursdays are dairy and every other day of the week is meat.) It is under Chof-K certification. NYU’s cafeteria offers a wide selection including fresh fruit, salad, and dessert bars, wraps, sandwiches, soup, and four entrées per day. According to NYU’s former OU-JLIC Torah Educator Rabbi Gideon Black, the cafeteria is a “hub” for Orthodox students, who spend several hours studying, davening with a minyan that meets there, and getting the most food possible out of their all-you-can-eat plan. NYU students, unlike those at many other schools in the country, are also afforded access to dozens of kosher restaurants across New York City, just a subway ride away. Yale University’s kosher kitchen is operated by the Slifka Center for Jewish Life at Yale. It is located on the bottom floor of the Slifka Center, but is fully integrated in the university dining plan. It is certified by the Va’ad of Fairfield. There are several other kosher options around Yale that are under local certification, including the dairy restaurants Claire’s Corner Copia and Edge of the Woods. At many other universities, such as Cornell and Princeton, while one can find kosher food on campus, there are very limited kosher offerings nearby other than what one can find in the supermarket. At several state schools including the University of Maryland and Rutgers University, students can purchase private kosher meal plans with Hillel or, in the case of Rutgers, the local Chabad. The University of Maryland publishes its weekly menu online and features brunch on Sundays, lunch and dinner throughout the week. For lunch and dinner there is a vegetarian soup, a meat-based soup, a meat entrée and a vegetarian entrée, a starch, vegetable and dessert. An average lunch at the University of Maryland might feature a split pea soup, beanless chili, mushroom meatballs, lentil roasted pepper medley, tomato garlic fettuccine, steamed red cabbage and blueberry pie. Rutgers Chabad does not list menus online, though they usually include pizza, falafel, overstuffed hero sandwiches, pepper steak, tacos, wraps, grilled vegetables, burritos, and a variety of hot soups, fresh fruits and salads. This private model does not allow strictly kosher students to accompany friends or grab a cup of coffee or a bowl of cereal in non-kosher dining halls, nor can they invite their non-observant friends to join them for a meal without using a guest pass or paying for them outright. For students where there is no university-sponsored meal plan, anyone who chooses to buy into the private kosher option is locked in for the rest of the semester. While this isn’t an issue for students who are committed to keeping kosher from the start of the school year, it can make it more difficult for those who are growing in their observance while on campus. At Rutgers, students can purchase a less costly meal plan than the university’s to eat in the Chabad Dining Hall, or pay per meal. They can also go to the Hillel’s Bistro70 dairy cafe, which offers three daily pay per meals under the Star K’s supervision. Several other schools, like Brooklyn and Queens Colleges as well as York University in Toronto, have pay-as-you-go meals available as well on campus or nearby at restaurants for students and faculty throughout their urban campuses, with no university or Hillel-sponsored meal plans attached. Students like Natan Ross at Guelph University in Ontario would be happy with any of the above options. At Guelph there is no kosher meal-plan option, and while the university’s hospitality service offers kosher frozen airplane meals from Toronto purchased 24 hours in advance, there are currently no students on campus who do so. Ross is just one of very few frum students on campus currently, and strongly warned against subsisting on the frozen dinners for any lengthy period of time. The frozen food route is also an option at Rutgers if one wants to stay on a university-sponsored meal plan. While this would be appealing for students living in residence dorms not on the main College Avenue campus, there are few, if any, students who choose to do this at Rutgers on any given year. At Guelph, Ross survives on individual meals that his mother sends to him frozen, heated up double-wrapped in aluminum foil in a non-kosher apartment shared with several non-Jewish roommates. Ross keeps close tabs on all of his pots, pans, and utensils and explained that his roommates are incredibly respectful and careful. Obtaining kosher food is a logistical and necessary challenge, but not an insurmountable one, even for those with next to no on-campus offerings. Dani Klein, the founder of YeahThatsKosher.com, which helps kosher-keeping travelers find food, said kashrus is one of the biggest challenges for observant students. He added that students increasingly rely on local Chabad chapters, which have made campus outreach a high priority, as well as their local supermarkets, which today tend to carry a wide array of kosher products, even in traditionally non-Orthodox areas. Klein added that part of his time is now dedicated to helping students and parents figure out the kosher campus options. For those at schools with a wide variety of choices, life is simple and convenient by design. Jake Altholz, a junior at Brandeis, told us that the availability of kosher food was “definitely” a deciding factor in his school selection process. “While a lot of factors played into making my college decision, the availability of kosher food and just the campus’ way of making it so easy to be an observant Jew definitely played a major part in choosing Brandeis University for my undergraduate experience,” he said. Students on campuses where obtaining kosher food requires more effort, like those at Guelph, tend to say that as long as they were aware of what it would take to keep kosher before stepping onto campus, they didn’t mind the extra steps necessary to keep kosher.